So during my little blogging hiatus my dear grandpa had a birthday. 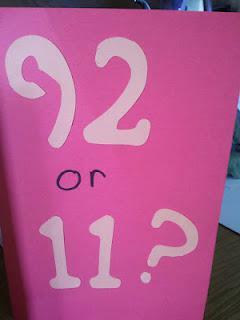 Or 92. But age is only a number, right? I am incredibly blessed to have my grandpa in my life. And am very thankful for the time I've been able to spend with him over the last 24 years. And I continue to learn things about him that I didn't know before! Like the fact that he lived in Chicago and Detroit for a while. He was also shared with me the secret to long life. When he was young and in the army, there group would have to move the whole group. Sometimes they would travel up to 20 miles in 8 hours with all their packs. I'm taking that as advice to be more active. Especially since I sit at a desk for most of the day at work. So today I have a story for you about some times I remember with my grandpa. Remember that one time when...softball stories. Growing up in the same town as my grandparents meant that we got to see them and spent time with them often. My brother and I played a lot of games when visiting too--The Roadrunner Game, Battletops, the shooter-pool game, and many other games. Those games were probably 20+ years old by then, but we still loved them. Another thing we loved to do was play softball with my grandpa. We would go to the empty lot by the house carrying the bat, the ball, and home plate. Pretty sure we were still playing with a wiffle ball, but it's hard to remember all the details. My grandpa would pitch the ball to one of us and we would try to hit it. After a few hits, my brother and I would switch and the next person would be up to bat. I loved playing this! It's probably why through the years softball has always been my favorite sport to play. We would always play this game near the neighbor lady's rickety, old garage. The garage door had a gap underneath it and sometimes, if you weren't quick enough the ball would roll under the door. Of course, this neighbor lady happened to be an old crank. If the ball rolled under the door, we were done playing softball for the day. My grandpa would tell us that he would have to wait to ask the lady to get the ball out some other time. I don't think my brother and I ever understood why he couldn't just go and ask her to open the door, but we obliged anyways. It was probably time for my grandparent's favorite show Jeopardy and we needed to go back to the house! Another thing I remember about my grandpa is him to trying to play tricks on me. At family get-togethers, a whole bunch of family would play games and sometimes we would play a round of softball. The games were never very competitive as there was quite an age range of the people playing. My grandpa was pitching and he had the ball in his glove. I was on base and he wandered over to me and told me he needed to clean off the base so I needed to step off it. Well as soon as I did, he would tag me out with his glove! Of course, I was never really "out", but I wised up pretty quickly and would call time or pick up the base myself to clean it off. What's a favorite memory of your grandparents?